During Unveiled: 200 Years of Wedding Fashion from the Victoria and Albert Museum, London there has been much gasping and musing over the number of teeny tiny waists on display, and those elegant instruments of torture, corsets. I, however, have been captivated by sleeves – dropped, ruched, puffed and frilled. The creators of 19th century fashion certainly had an inventive approach to sleeves. The sleeves that have particularly piqued my interest are from this week’s wedding gown. 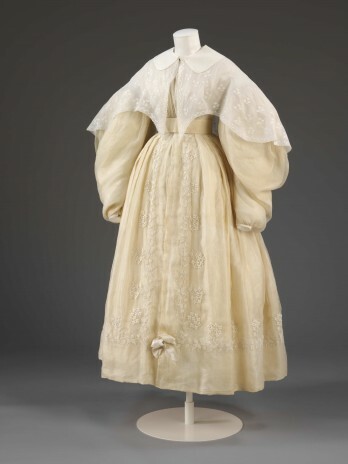 The embroidered muslin gown below is believed to have been worn by Mary-Anne-Grace Quin who married Herbert Mayo on 3 November 1834 in London. The dress is described as having ‘large imbecile sleeves’. Imbecile sleeves? Embroidered muslin wedding dress, lined with silk, British, 1834. Probably worn by Mary -Anne-Grace Quin who married Herbert Mayo on 3 November 1834 in London. While I had heard of ‘Lamb-O-Mutton’ and ‘Bishop’ sleeves I had never heard of the ‘Imbecile sleeve’. Neither had my colleagues. What did such a term reference? We looked at the gown intensely. Was it a reference to the twisted nature of the sleeve? Were imbeciles once-upon-a-time forced to wear some sort of large sleeved garment, a big sleeved straight-jacket of sorts? Well no. The Oxford English dictionary cuts to the chase on its definition of ‘imbecile’. Noun – ‘a stupid person’. Adjective – ‘idiotic’. This is exactly what a number of detractors thought of the women who indulged in big sleeved fashion. The detractors had a point, especially when sleeves became so large that women had to turn sideways in order to get through doors – a sight much lampooned in men’s magazines. In today’s parlance, imbecile sleeve wearers were quite simply ‘fashion victims’. Worn in conjunction with a bell skirt, the size of the sleeves and skirt aided the visual illusion of the all important teeny tiny waist. Oversized sleeves were fashionable from the mid-1820s through to the mid 1830s, at which point their dimensions were tamed. But slender sleeves also had their ‘prejudicial’ problems. After a few decades of stream-lined sleeves, the big sleeve returned in a vengeance in the 1890s, when designers revitalised the unpleasantly named ‘Leg-O-Mutton’ sleeve (‘Gigot’ in French). This 1894 wedding gown from Te Papa’s collection aptly illustrates the Leg-O-Mutton trend. It is made from a pin-stripped blue silk. Wedding dress, 1894, Wales. Maker unknown. Gift of Miss C Rothwell, 1982. Te Papa. 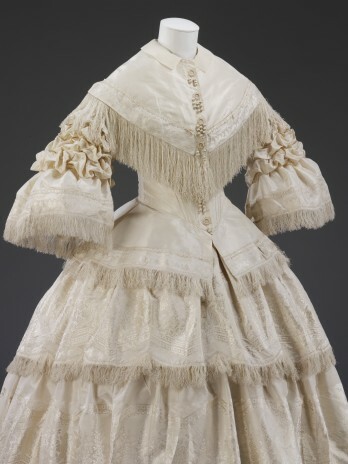 In order to keep the pouf or the puff in such voluminous sleeves, additional forms of support were employed, including large down-filled pads, whalebone strips stitched into sleeves and even wire ‘sleeve bustles’. The latter certainly were not built for comfort. Quoted in Lucy Johnston’s gorgeous book Nineteenth Century Fashion In Detail, published by the V&A which is available from the Te Papa Store.